Mens brown dress shoes are a gem within the world of men’s fashion. Contemporary design has brought in a revival of earthy tones, dark browns, and minimalist style options layering, contrasts of basic but striking colors. A well-selected pair of brown dress shoes in the right tone and style are extremely versatile while creating a stunning pairing selection with both formal and casual attire. Black dress shoes are the go-to choice for most, however brown dress shoes often make the difference between predictable style and personality-filled fashion sense. Here, we’ll be taking you through a range of color combinations, style choices and clothing pairings best suited to brown dress shoes. When and even whether you should ever wear brown shows has long been a cause of excitable and heated debate with lots of phrases making their way into our everyday vernacular based around this very topic. You’ve probably all heard your grandfather say at one point, “no brown in town” or the other common phrase “no brown after six” when you yourself arrived at midday wearing yours! It was none other than the very sartorially elegant Edward, Prince of Wales, who was in fact responsible for many of the gentlemen’s fashions that we still see around today, who brought brown shoed into prominence. By the 1950s, brown shoes were getting a special mention in clothing guides of the day and had become more acceptable, with certain conditions. While black was still very much the respectable and accepted color for the evening, brown shoes had made their way into more regular daytime attire. Thankfully, today’s fashion is friendlier and less rigid in its rules and conventions, allowing you, the wearer, to take responsibility for your own decisions. 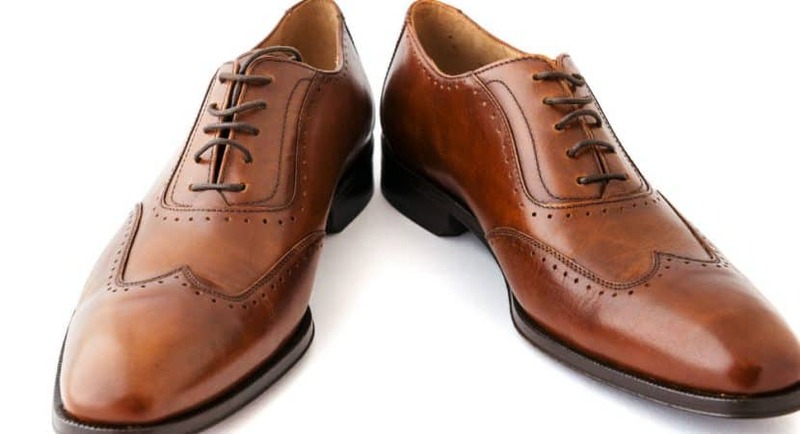 With so many people today also opting for casual looks, by the sheer fact that you own and are wearing brown dress shoes, you are already a well-heeled cut above the masses and clearly know a thing or two about respectable men’s fashion and shoes. The fact that you can also get brown shoes in so many different hues and shades has also added to their versatility and appropriateness for many a casual and formal occasion. So just to quickly recap on the whole brown show debate, they can and are worn with just about anything these day. From jeans to corduroy, flannels to tweed and every trouser fabric in between, there is a place for brown shoes. The real beauty of them is that unlike a black dress shoe which is, you got it, only black, a brown dress shoe comes in a myriad of alternative shades and combinations to create something very stylish and attractive looking. You can wear them with your business suits as well as your casual suits, with a blazer or sport coat for a smart trouser combination look. The classic color contrast of black and brown is renowned due to the simplistic style which it brings to any outfit. Try a predominantly black look, using brown dress shoes and one other brown-shaded item of clothing, such as a jacket, shirt or undercoat, to bring about a great binary contrast. When it comes to color combinations too, brown does look very dashing teamed with a range of other colors and in particular, cuts quite the statement worn alongside red, green, khaki, tan, cream and of course all variants of light to dark browns. Brown dress shoes, then, are actually very versatile and well worth the investment. While they will never replace your black dress shoes for very formal occasions where a morning coat or stroller is required or with a black tie or tuxedo, they can be worn for pretty much any other occasion and with so many colors. Brown dress shoes are not generally recommended for formal morning dress, where a morning coat or stroller is worn, nor for formal evening dress, such as white or black tie events, however, anyone who works in a formal office environment will find far better use out of a pair of brown dress shoes than with plain black oxfords. Both dark and light grey suits work equally well with brown shoes. If opting for a dark grey suit, darker shades of brown are best, while lighter-grey shades such as a light charcoal or ivory work better with a light brown, or tan colored pair of dress shoes. Be sure to only opt for a blue suit, of any shade, if you are sure that you want to stand out. The result of pairing a light brown style such as wing-tipped or tasseled Derby with a sky-blue suit and a neutral shirt is striking, to say the least. Navy is a safe bet when it comes to brown shoes. Navy suits suit almost any shade of brown. Light-brown dress shoes pair surprisingly well with dark colored jeans, but only when you accentuate that same shade of brown with a jacket of the same color. The rustic style is great, especially when wearing a neutral-colored T-shirt. White works very well, although any earthy tone such as a light green, grey or even soft colors such as plum or pink create stunning results as well. Dark brown dress shoes are the best match for black pants, with the elegant appeal being highlighted even more through the addition of a brown hat and/or a watch with a thick leather strap. A casual appeal can be had with any brown shoe which does not carry too high of a shine. Simply change up the color of your laces to create a pairing between your choice of color and your shoes. Brown is not a color that you wear throughout every item of your outfit. It needs to be integrated into your other items of clothing. If wearing brown shoes, always make sure that your belt is a match for both the color and tone. It doesn’t have to be exact but it should be close. When wearing brown dress shoes as a pairing to the color of your jacket, be sure to keep the color of your shirt neutral. It is very hard to match vivid colors with brown shoes, especially in the case of casual wear, unless you repeat the color through the use of a matching hat. If you are undecided over which shade of brown to choose for any given formal suit, then go for the shade which is darker than your pants. In most cases, you can’t go wrong. A final word on what socks to wear then with your brown shoes. Really, that final stylish element is going to be determined by the rest of your outfit and more importantly, the color of your trousers but variants of blues, contrasting browns, burgundy and greens are striking sock options contrasted with your stunning brown dress shoes. When one looks at the long-term possibilities of a good pair of brown dress shoes, the styling options are nearly endless. A high-quality pair of leather brown dress shoes can even go through a process known as patina whereby an artistic coloring is given to either new or aged shoes. This brings out the neutral colors and creates a unique contrast, accentuating what is already there. Many high-end brands even incorporate this process into their craftsmanship to deliver superior designs, perfect for upmarket events, formal occasions, and style in the workplace. On the other end of the spectrum, single-colored brown dress shoes suit both casual and formal attire very well, making them supremely versatile. Every wardrobe needs a good pair of black Oxfords, but a few varying shades of brown dress shoes will serve you even better.